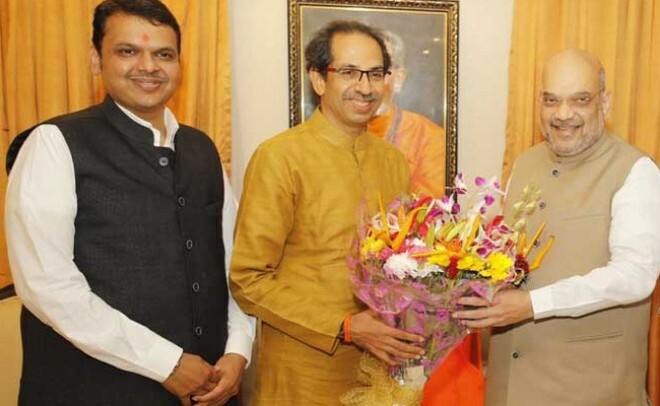 Mumbai, Feb 19: Putting an end to all the strained ties and speculation of going solo, the Bharatiya Janata Party and Shiv Sena on Monday announced a seat-sharing pact for the ensuing Lok Sabha and assembly elections in Maharashtra. The announcement was made at a joint press conference in the night by BJP president Amit Shah and Sena chief Uddhav Thackeray. The Ram temple has been the common thread for the alliance between BJP and Shiv Sena and has to be built at the earliest, Thackeray said. BJP and Sena are parties with a national ideology which have come together in wider public interest, Fadnavis said. In principle, both the parties are pro-Hindutva, he added. Fadnavis also announced that the Nanar refinery project proposed in coastal Konkan will be shifted to a place acceptable to people. Shah said it was the wish of the workers of the BJP and the Shiv Sena that the two parties joined hands for the elections.